What's happening with Bill Gates' multibillion-dollar energy fund? 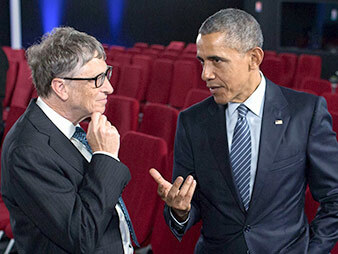 Microsoft co-founder Bill Gates surrounded by President Obama and more than a dozen other world leaders announcing a global effort to double clean-energy research and development funding with a major side effort by private-sector billionaires. Photo courtesy of Wikipedia. First in a two-part series. Click here for part two. This story was updated at 5:21 p.m. EDT. Bill Gates believes the key to addressing climate change is an "energy miracle," and in November, he set about trying to conjure one. Flanked by President Obama and more than a dozen other world leaders in Paris for the first day of a landmark climate summit, Gates claimed a role for the private sector in delivering new solutions. "We must ... add the skills and resources of leading investors with experience in driving innovation from the lab to the marketplace," Gates said that morning. "The private sector knows how to build companies, evaluate the potential for success, and take the risks that lead to taking innovative ideas and bringing them to the world." But months have elapsed since the Microsoft Corp. co-founder and 27 other billionaires rolled out their Breakthrough Energy Coalition (BEC) — a promise to invest billions of dollars with a very long payback horizon on groundbreaking new carbon-neutral technologies. And the group has barely been heard from since. Jonah Goldman, a spokesman for the coalition, said much of the work is happening behind the scenes. The fund, he said, will make announcements about the kinds of investments that will be made when it is up and running, likely toward the end of this year. "But the focus is definitely more on doing the work we've committed to than making public pronouncements," he said. A few things are clear. Some of the group's contributions will flow through a fund that will concentrate on certain kinds of investments. The group is currently hiring scientists and investment professionals who will direct those decisions. Goldman declined to say how many people are working to stand up the fund or how many employees it will eventually have. Other things remain a mystery, including the coalition's eventual capitalization target. Gates promised to invest an additional $1 billion of his own dollars when he launched BEC, and predicted the other members would contribute a collective "couple" billion more toward the venture. But it is unclear how much of that $3 billion — if it is $3 billion — will flow through the fund, versus members investing it independently. Goldman said the total size of the fund and targets for investment will be based on this year's fundraising. He said the goal would be to raise a level of capital that the fund could deploy effectively, with the understanding that some of the group's members will continue to invest in projects outside the fund. "We feel tremendously confident that we will get significant participation in the ultimate funding vehicle, but each of the potential investors will have to make that decision based on the terms presented, and we're not quite there yet," he said. But he added that transparency will be a guiding principle when the fund is on its feet, "because we feel like we have an obligation based on what we did in November to not only invest the money but to continue the conversation." Part of Gates' purpose in cobbling together the investors' coalition in the immediate runup to Paris was to earn innovation a place in the spotlight as the world huddled to consider a response to warming. The billionaire had long argued that today's technologies alone would not be enough to deliver the kinds of cuts the world would need — especially as the century progresses. "Given the scale of the challenge, we need to be exploring many different paths — and that means we also need to invent new approaches," Gates said during the coalition's rollout. "Private companies will ultimately develop these energy breakthroughs, but their work will rely on the kind of basic research that only governments can fund. Both have a role to play." It's the same innovation pipeline that once delivered the revolution in internet technology that earned Gates his fortune. Gates has long said the federal government is doing too little to move the ball forward on advanced energy. BEC was not his first effort to persuade it to step up its game. In 2011, he launched the American Energy Innovation Council with business luminaries including venture capitalist John Doerr and General Electric Co. CEO Jeff Immelt to lobby for a $16 billion annual U.S. budget for energy research and development. That's about $10 billion more than was spent in fiscal 2016. President Obama talks with Microsoft co-founder Bill Gates on the sidelines of the Paris climate negotiations in December. Photo courtesy of the White House. He brought his message to Capitol Hill, where he met twice with Sen. Lamar Alexander (R-Tenn.) in the past year to press the Energy and Water Appropriations Subcommittee chairman for federal support for research and development. The two men discussed small modular nuclear reactors and carbon capture and storage technology at the meetings, an Alexander aide said. Then, in the three months before Paris, Gates bore down. He joined Energy and State department officials and White House personnel on calls with foreign governments to urge them to sign on to Mission Innovation, a commitment by countries to double their individual R&D budgets by 2020. Energy Secretary Ernest Moniz spearheaded the initiative, which was unveiled in Paris alongside BEC (EnergyWire, Dec. 17, 2015). On those calls, former officials say Gates offered the private investors fund as a kind of carrot, promising to help carry technologies produced in national laboratories across the "valley of death" — where ideas often perish for lack of investment — toward greater development that leads to commercialization. But first governments had to put up the money. "I think it was a pretty perfect example of a friendly race to the top on both sides, public and private," said Paul Bodnar, a former senior director for energy and climate change at the White House's National Security Council who was instrumental in readying Mission Innovation ahead of Paris. Nineteen countries joined the United States in backing Mission Innovation in Paris, and the European Union signed on in June. Since then, the Obama administration has followed up with a fiscal 2017 funding request of $7.7 billion for clean energy R&D across the federal government, with $5.9 billion of that going to DOE programs. The U.S. government would need to increase its R&D budget to $12.8 billion in 2021 in order to remain on track to meet its Mission Innovation goals. 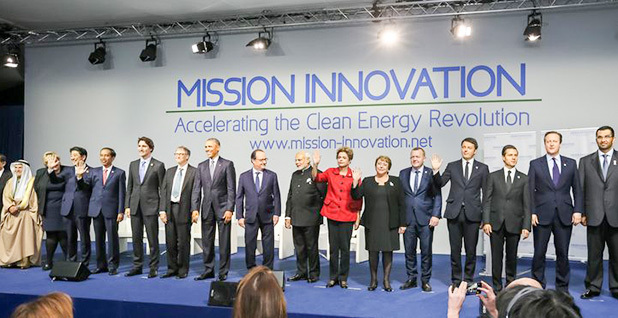 The governments participating in Mission Innovation have made their targets clear. The 20 original members promised to devote $20 billion annually to R&D by 2020. The group later increased its combined pledge to $30 billion annually by 2021. While funding is dependent on continued political support in the United States and other countries, it will be fairly easy for third parties to track whether those pledges are met in the coming years. Mission Innovation, which is composed of countries responsible for 90 percent of the world's energy R&D, has already publicly agreed to a governance structure and is in talks about ways to coordinate. DOE was less forthcoming about its work with BEC post-Paris. A department spokesman said in response to an inquiry only that the agency "is in communication with thousands of researchers, entrepreneurs, inventors, small businesses and large corporations." While the spokesman asserted that the investors' group and Mission Innovation are "separate" and "complementary," the private-sector group has popped up in DOE communications with interested members of civil society. It figured, for example, in a slideshow presentation that Office of International Science and Technology Collaboration Director Robert Marlay prepared for the U.S. Energy Information Administration earlier this year. The presentation states that the fund would provide "seed, angel and series A" investments. Seed capital is offered in exchange for a stake in a company, while angel investments help startup companies. "Series A" investments are typically the first round of venture capital investments that are made in a new company. "Once derisked, traditional investors may follow," the slide states. Some of the Gates group's radio silence appears to be strategic. Bodnar said Gates and his partners opted not to put forward a concrete pledge of dollars in Paris because it wasn't a venue where the contribution would appear in its best light. Even a funding target that would be enough to fulfill the group's goal of readying promising technologies for the market would pale in comparison to the hundreds of billions or even trillions of dollars that are routinely discussed in the multilateral climate process. The combined promise by rich countries to raise $100 billion a year by 2020 to help developing countries cope with warming is often viewed as insufficient, for example. "The upside of putting a number on it was low, and the downside seemed high," Bodnar said. But what the 28 billionaires managed to do was to signal there will now be "truly patient, flexible" capital available for promising technologies that make it through the basic research phase. Patient capital is seen to be key, because the high risk and very long time horizons for payback have generally made these technologies unattractive to conventional investors. Bodnar said Gates and his colleagues were confident that the money they put up would be sufficient to ensure the gap is bridged between federally funded basic research and ready-to-deploy commercial technologies. None of the half-dozen observers interviewed for this story viewed the coalition as moving too slowly in standing up its fund. In fact, some noted the fund wasn't even part of the coalition's original concept. It came about because while some coalition members — especially hedge fund manager and green technology investor Tom Steyer, Virgin Group founder Richard Branson, and Doerr — have the infrastructure in place to invest in clean energy, others do not. The fund was conceived to help them, the spokesman said. U.S. Special Envoy for Climate Change Jonathan Pershing said in a recent interview with ClimateWire that a breakfast meeting the BEC held with ministers during a Clean Energy Ministerial meeting in San Francisco in June assured him the coalition was making progress. "Certainly, the enthusiasm that was expressed at that breakfast was very high," Pershing said. "Their commitment to invest was very high." Dan Reicher, executive director of the Steyer-Taylor Center for Energy Policy and Finance at Stanford University and a former DOE assistant secretary, said Gates and his colleagues were wise to channel their support to technologies that are past the basic research phase but still not ready for commercialization. It's a stage of development where limited support exists and dollars can go far, he said. "They're trying to do something novel, and it doesn't surprise me that they're taking some time to put it together," Reicher said. Tomorrow: Does the world really need an energy "miracle"?